The eurozone crisis - with its numerous rolling summits, announcements, proposals, simultaneous economic and political developments in multiple member states and fast-paced market reactions - has brought Twitter to the forefront of EU reporting and analysis. Unlike English football commentator Mark Lawrenson, at Open Europe (as in @openeurope) we like twitter and use it to keep up with various euro developments, as well as to flag up key events and our own analysis. It's a great supplement to our increasingly popular daily press summary. Of course, the key is not only to tweet fast - and summarise often complex economic and political concepts in 140 characters - but to also get it right. Which is why we were very pleased to see that Barron's - a leading American financial magazine - has selected Open Europe's twitter account as one of five that “consistently provide great information and trenchant analysis” on the Eurozone crisis. "Once again, Twitter is proving its mettle as a source of instant news and analysis—this time on the euro crisis. Just as it did last year during the Arab Spring and the meltdown at Japan's nuclear plants, the social network is producing a constant stream of real-time information on the big news story of the day—some of it spot-on, some not. The trick is to follow the right people, or tweeps, and Barron's is here to help with that." Many thanks for that. 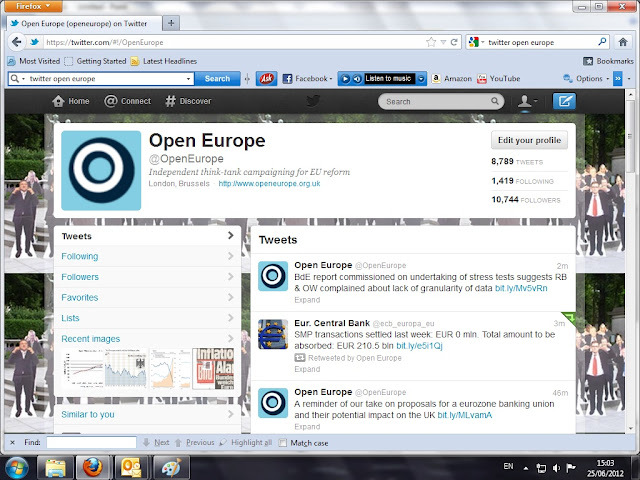 Please forgive us the shameless self-promotion but if you don't already, do follow us on twitter @openeurope. Ps. The other four selected are @pawelmorski, @economistmeg, @LorcanRK, @alea_ - all worth following.